How often do you get out of your car and go inside a bank to talk to a teller? I’ll venture a guess and say, not often at all. And of course, that’s because of Automated Teller Machines, or ATMs. ATMs were first introduced by Chemical Bank in 1969. And they are now completely ingrained into our daily lives. ATMs are just one successful example of automation. Indeed, our world is rapidly becoming highly automated thanks to the rise of robots. I’m not talking about the “Lost in Space“-type robots. I’m referring to the industrial robots that toil away in factories all around the world. Today’s factories are highly automated and use amazing robotic machines to do the work of thousands of humans. These factory machines look nothing like the robots you see in movies. They are a very specialized breed called CNCs, or Computer Numerical Control machines. General Motors was the first company to put a modern-day industrial robot to work in 1961. 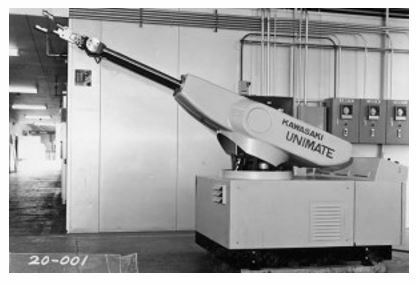 The Unimate was a 4,000-pound robotic arm that attached to a giant steel drum. It did things like pour liquid metal into die casts, weld auto bodies and lift 500-pound car bodies. The Unimate performed tasks that humans often found dangerous or boring. And it did them with speed and exacting detail. The robot never called in sick, asked for a raise, or went on strike. Plus, it worked 24 hours a day! Robots are a productivity and profit lifesaver for factories. So it’s no wonder that the growth of industrial robots is skyrocketing. 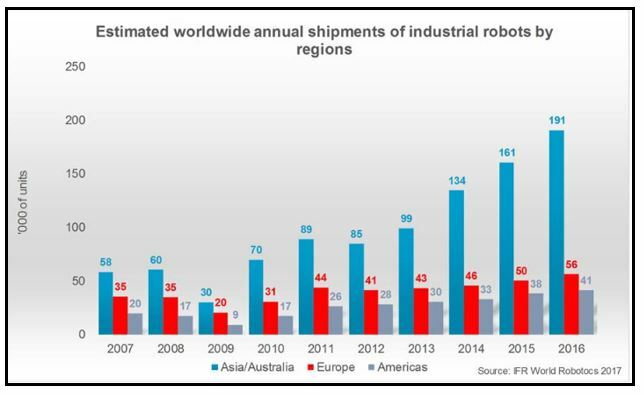 The International Federation of Robotics reported that global robotic sales increased by 16% to $13 billion in 2016. And they are expected to jump by another 18% this year, and by at least 15% a year between 2018 and 2020. Technology watchdog Research and Markets forecasts that the robotic market will grow from $34 billion in 2016 to $226 billion by 2021. That’s a compound annual growth rate of a whopping 46% a year! Historically, the automotive, machinery and electronics industries have been the main users (approximately 70%) of industrial robotics. But the newest robots are so skillful that they can do tasks that previously could only be performed by humans. Get this: The Massachusetts Institute of Technology created a “family robot” named Jibo. Jibo uses facial recognition to identify family members and read bedtime stories to children. Oxford University researchers estimate that 47% of U.S. jobs could be automated within the next two decades. The result is that a new tidal wave of demand is coming from non-industrial applications, such as fast food, agriculture, medical, consumer, military and driverless vehicles. Another tidal wave is coming from investors. According to Morningstar, cash inflows into robotics-focused ETFs hit $9 billion this year. That’s a record level. What’s the best way to ride this wave and invest in the robotics revolution? There are several publicly traded companies that produce industrial robots. But my No. 1 pick is Japanese robot giant FANUC Corp. (FANUY). Here’s why now is the time to get passionate about robotics … and about this company. 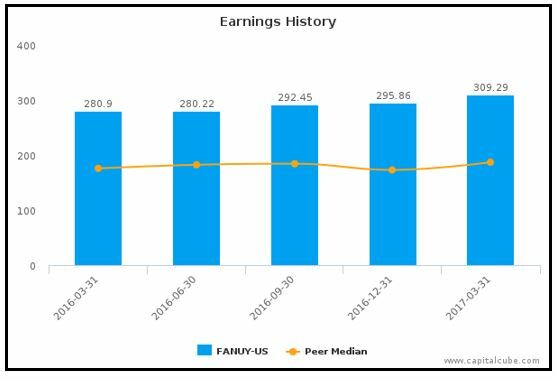 Stock of the Month: FANUC Corp. Odds are you’ve never heard of FANUC. But it dominates the industrial robotics industry as the largest manufacturer in the world. Moreover, I bet you own something that was built by a FANUC robot, such as a Ford car or an Apple iPhone … to name just two. FANUC, originally a division of Fujitsu, stands for Fuji Automatic Numerical Controls. It is a component of the Nikkei 225, the Japanese equivalent of the S&P 500. FANUC manufactures a wide range of robots for the aerospace, automotive, consumer goods, food, metal fabrication, medical, pharmaceutical and solar panel industries, and many others. How much of a market leader is FANUC? According to Arc Advisory Group, a staggering 60% of the robotics tool systems — lathes, grinders and milling machines that turn metal into just about any manufactured product — in the world use FANUC controls. FANUC has over 100,000 robots installed in the Americas and another 220,000 installed around the world. And that number is about to explode. Reason #1: The Marriage of Artificial Intelligence and Robots. FANUC has been in business since 1972, but its greatest growth is just around the corner. Why? Because the company is on the cutting edge of integrating artificial intelligence with robots. That means robots will soon have the ability to handle significantly more complex tasks. Up until recently, industrial robots could only be programmed to perform repetitive tasks. As such, they didn’t require artificial intelligence. Artificial intelligence makes it possible for industrial robots to solve problems and even learn. For example, surgical robots are performing operations with such precision that the error rate is not only superior to humans, but it is approaching zero. Robots are about to move out of the industrial world and into all aspects of our daily lives. Reason #2: The Robot Employment Act. In 1968, the minimum wage was increased from $1.40 to $1.60 an hour. I was 14 years old at the time, and my vegetable farmer father was furious when I asked him for a raise. Of course, $1.60 an hour sounds like nothing today. I’m sure my father would be rolling over in his grave about the push in many jurisdictions to raise the minimum wage to as high as $15 an hour. A total of 19 states have increased their minimum wage in 2017: Alaska, Arizona, Arkansas, California, Colorado, Connecticut, Florida, Hawaii, Maine, Massachusetts, Michigan, Missouri, Montana, New Jersey, New York, Ohio, South Dakota, Vermont and Washington. Plus, Oregon, Maryland and Washington, D.C., will increase their minimum wages later this year. Hey, I know what it feels like to be poor. So I completely understand that a boost to the minimum wage would feel like a great windfall. But I believe the long-term effects of a substantially higher minimum wage would hurt the exact people it aims to help. I say that because raising the minimum wage, combined with the improvements in automation technology (robotics), will in fact harm lower-wage workers more than it benefits them. How so? Businesses are replacing human labor with machines to reduce labor costs. The National Bureau of Economic Research, a non-partisan economic think tank, studied the issue and concluded that many low-skilled workers would lose their jobs. “We study the effect of minimum wage increases on employment in automatable jobs – jobs in which employers may find it easier to substitute machines for people – focusing on low-skilled workers from whom such substitution may be spurred by minimum wage increases. Minimum wage or not, the use of automation/robotics is taking off. According to the Association for Advancing Automation, robotics sales in North America reached record highs in the first half of 2017, growing by 33% in units and 26% in dollars over the first half of 2016. But that’s just the tip of the iceberg. Barclays predicts that robotics sales will increase by more than 1,000% and hit $82 billion between now and 2020. Reason #3: China! China is the world’s largest market for robots, with about 30% of global sales. And that number is going to skyrocket. As a result, China has implemented a policy called the Made in China 2025 plan. And with that policy, China plans to automate the majority, if not all, of their manufacturing facilities. That translates into an additional 600,000 to 650,000 new industrial robots by 2025. This is big news for the robotics industry. It will more than double the world population of industrial robots, many of which will be produced by FANUC. “Everything comes down to China. That’s where the growth is,” said FANUC. Reason #4: Follow the Leader. How much of a market leader is FANUC? Remember, it makes 60% of the robotics tool systems in the world. That’s because, when it comes to robotics, nobody is as innovative as FANUC. The company holds the most patents in the “robotics” category of any company in the world. Moreover, Forbes magazine includes FANUC in its list of the World’s Most Innovative Companies. The 100-company list was based upon a comprehensive eight-year study and attempts to identify companies that are likely to continue to succeed today and in the future. You can’t assign a dollar value or estimate the impact on future earnings. But it should make you feel confident that FANUC is going to be around for a very long time. Reason #5: Off the Wall Street Radar Screen. You’ll have a hard time finding a company as secretive as FANUC. In fact, it behaves more like a top-secret military installation than a publicly traded company. FANUC shockingly doesn’t have an investor relations department and doesn’t have conference calls for analysts. FANUC only gives bi-annual performance updates. And even those are often short and cryptic. Email is limited to just a small handful of office computers and carefully monitored to guard against leaks of corporate/technology secrets. Most communication is done by phone and old-fashioned fax machines. That is unacceptable to the Wall Street crowd since they think everybody should kiss their rings. Wall Street has largely ignored FANUC because of this scant information flow. And that means more potential profit for us. Reason #6: Red-hot Japan. Is Abenomics working? I’m skeptical about the long-term benefits of easy money, massive deficits and an unlimited monetary printing press. But the short-term benefits of all that stimulus is a red-hot Japanese stock market. The Nikkei is up 17.8% year-to-date. And it recently reached a new, 21-year high on Prime Minister Shinzo Abe’s re-election in October. It wasn’t a surprise that Abe was re-elected. But the size of his victory was larger than expected. This was a clear endorsement of Abenomics as well as the Bank of Japan’s gargantuan monetary stimulus plan. Japanese inflation has remained stubbornly low, and well below the Bank of Japan’s 2% target. That gives this central bank a green light to keep interest rates in negative territory … to buy every government bond it can get its hands on … and to buy Japanese ETFs like there’s no tomorrow. It is almost hard to believe, but the Bank of Japan now owns about 75% of all the Japanese equity ETF shares on the market. That is absolutely ridiculous for a central bank to wade that deep into its own stock market. But Abe’s re-election essentially guarantees that we’ll see more of the same. For investors, that means even higher Japanese stock prices and a powerful tailwind for FANUC. FANUC trades on the U.S. over-the-counter market, currently trading right around $25 per share. And it is ripe for a rally. BUY FANUC Corp., symbol FANUY, at the market, to open. Ambarella (AMBA) received some bad news from GoPro. The newest Hero 6 cameras use GoPro’s own custom processor, called GPI, rather than using Ambarella’s chips, as they’ve done previously. This has resulted in a serious short-term hit to Ambarella’s profits. Just as troubling is the very positive review of the improved image quality for Hero 6. So the concern is that GoPro may just be the first rat to jump off the Ambarella ship. Ambarella’s long-term prospects are extremely bright. But the near-term outlook has suddenly turned negative. It is time to sell your shares. All subscribers: Sell Ambarella Inc., symbol AMBA, at the market to close. The iPhone X is so popular that people all over the world — including Japan, Singapore, India and Europe — camped out overnight to get their hands on it. In fact, the iPhone X has sold out and now has a very long waiting list. That’s a good problem to have. As usual, Wall Street grossly underestimated the demand for this newest version of iPhones. More importantly, Wall Street is underestimating the growth of Apple’s revenues and profits. Continue to hold. New Subscribers: Buy Apple, symbol AAPL, at $160 or lower. Costco reported its sales numbers for the month of October, and they were fantastic. Revenues increased by high single-digits — 7.5% same-store sales growth overall — and were especially strong internationally. E-commerce sales, by the way, are skyrocketing — up 31% in the last four weeks, and up 32.2% in the last eight weeks. Remember, a record number of brick-and-mortar stores are closing their doors all across the country. So Costco is one of the few retailers that is delivering steady sales growth. And this proves that Amazon, with its purchase of Whole Foods, is no threat to Costco. Continue to hold. New Subscribers: Buy Costco, symbol COST, at the market. Digital Realty continues to expand its global footprint. It recently opened a second data center in Frankfurt, Germany. That’s extremely important, because data centers truly benefit from economies of scale. DLR will pay a 93-cent dividend on Jan. 12 to shareholders of record as of Dec. 15. Continue to hold. New Subscribers: Buy Digital Realty Trust, symbol DLR, at $112 or lower. At 9.8%, Alibaba is the largest holding for EMQQ. That’s great news because Alibaba just reported blowout sales for Singles’ Day in China. Singles’ Day? Singles’ Day is the Chinese equivalent of Valentine’s Day and takes place on Nov. 11 of each year. 11/11 resembles “bare branches,” a description that is used to describe unmarried Chinese men and women. Alibaba pulled in $25.3 billion of sales on Nov. 11. That was a 39% increase from last year, translating to a whopping 256,000 transactions per second. 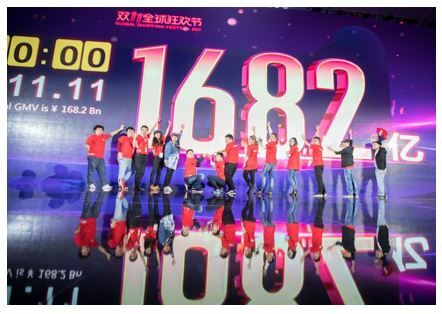 Clearly, Chinese e-commerce is gigantic and is still growing like crazy. Continue to hold. New Subscribers: Buy the Emerging Markets Internet & Ecommerce ETF, symbol EMQQ, at the market. With $1.4 trillion of deposits, JPMorgan is the largest bank in the country. But get this: JPMorgan pays nothing — zilch, zero, nada — on $400 billion of those deposits. How can that be? Well, that’s because most banks, including JPMorgan, do not pay interest on business checking accounts. And the free use of that $400 billion is one of the reasons JPMorgan has been minting money. Continue to hold. New Subscribers: Buy JPMorgan Chase & Co., symbol JPM, at $98 or lower. Order backlog of $17.7 billion, up from $17.1 billion 90 days ago. Best of all, LDOS boosted its full-year guidance to $10.1 billion to $10.4 billion in sales, and $3.45 to $3.60 in profits. Continue to hold. New Subscribers: Buy Leidos Holdings, symbol LDOS, at the market. Microsoft delivered excellent quarterly results. 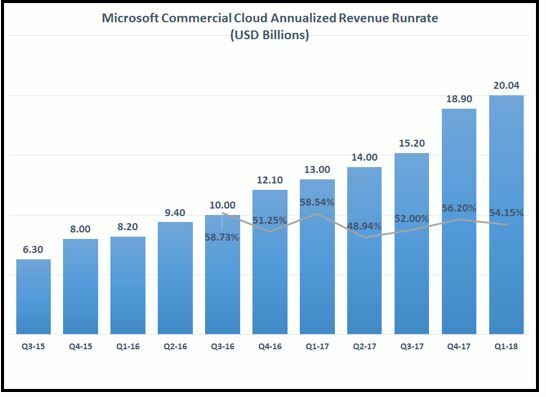 But the one standout was the growth of cloud revenues from its Azure division, which came in at an annualized rate of $20 billion. Please excuse the pun, but the sky’s the limit for Microsoft’s cloud business. And that’s going to power its profits higher and higher for many years to come. Continue to hold. New Subscribers: Buy Microsoft Corp., symbol MSFT, at the market. In broad terms, data comes in two formats: structured and unstructured. Structured data is data that has a defined length and format for big data, such as numbers, dates, groups of words, and numbers called strings. Unstructured data resides in emails, files, PDFs, Word or Excel files. This type is often not encrypted and therefore very vulnerable to hackers. The explosion in unstructured data is why the services Proofpoint offers is so critical. Continue to hold. New Subscribers: Buy Proofpoint Inc., symbol PFPT, at the market. Business is booming at Square, as it delivered better-than-expected revenues and better-than-expected profits. Plus, it increased its Q4 forecast. What impressed me the most was the jump in gross payment volume, or GPV, to $17.4 billion. That’s a 31% year-over-year increase. Remember, Square gets a piece of every credit/debit card transaction that it processes. So the jump in GPV is the most indicative metric of Square’s growth. And on that basis, Square is growing like a weed. Continue to hold. New Subscribers: Buy Square Inc., symbol SQ, at the market.